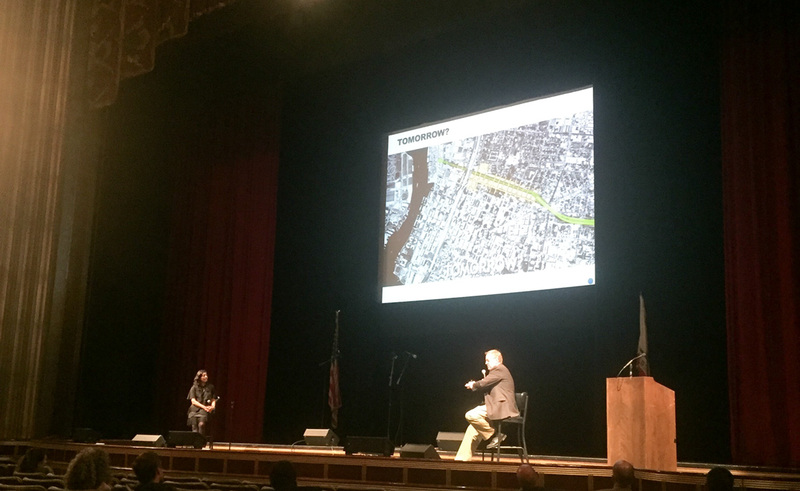 Following the Mayor’s State of the City Address on October 28th, the Downtown Specific Plan Team led by Dover/Kohl presented the results of the previous week’s public Charrette. Starting with the public meeting on Monday, rethinking I-980 was a popular topic of conversation with the community. 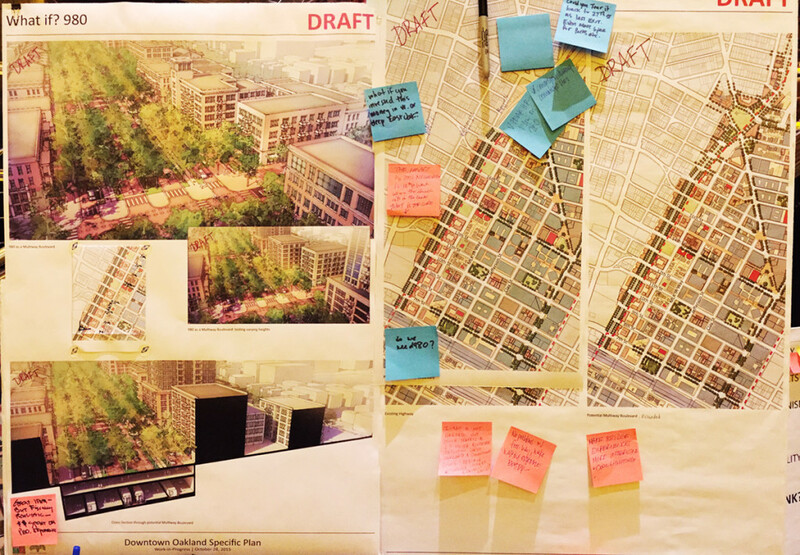 Connect Oakland participated in the Charrette throughout the week and are happy to see that rethinking the I-980 corridor is a priority of the community and the City and will be part of the Downtown Plan. Dover/Kohl, the planning firm working on the Downtown Specific Plan, articulated a preliminary concept for the future of I-980. During the Charrette, the Dover/Kohl team took the Multiway Multi-modal boulevard and integrated it into the draft proposals for the Downtown Plan. To learn more about the downtown planning process please visit the Oakland Downtown Specific Plan. To learn more about ConnectOakland’s concept for I-980, please check out our vision. Any effort to remove 980 would be an unqualified disaster. This is primarily a urban pipe-dream planners fantasy, and has far more to do with salivating developers wanting an opportunity than any intelligent traffic management. On the same vein… we could fill in the 4 bores of the Caldecott tunnel and then, just imagine, there would be the abandoned hwy 24 land that could now be used for housing plots and “connect” Oakland to Berkeley!! SMH. Seriously? Have you people driven anywhere lately/ They are adding tens of thousands of people in Alameda and Brooklyn Basin. Where are they going to go to get to the inner east bay. Don’t tell me to bicycle. I am 62 years old. I need to get to WC to see my ailing parents. I don’t have 3 hours each way to do that. If you put all that traffic onto San Pablo, Kaiser hospital will take longer to get to for everyone including the ambulances. I walk and ride here in Alameda. I cannot go to many places on public transport because it takes way too long, doesn’t run where I need to go or is unsafe. BART is insufficient in many ways inlcuding hours, scehedules and capacity. The increased population in the inner Bay Area demands a level of efficiency in transportation infrastructure that single occupancy vehicles and inefficient routings cannot provide. Replacing 980 with an interwoven grid of streets atop rapid transit and rail will increase the traffic capacity of the corridor by 250%. Even at rush hour I-980 only carries a fraction of its intended capacity. The replacement boulevard can carry 75% of the existing highway traffic, and would allow better diffusion of the traffic to other routes such as Broadway, Telegraph, and San Pablo. Intriguingly the replacement boulevard can also connect Webster St. in Alameda to 24 at the 580 interchange via a bridge at Howard Terminal and bypass the congested Webster and Posey tubes; in twenty years when the project is complete this would actually improve the personal trip itenerary that you describe. Alternately you could use the proposed BART infrastructure to ride from Alameda to Lafayette, and use car share or ride-sharing to complete your journey. At most such a journey would take an additional 15 minutes not the hyperbolic 3 hours you describe.